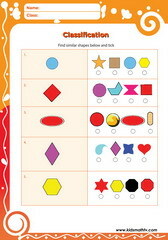 Classification of objects and numbers worksheet for children in preschool to 5th grades. Learn to classify and order objects by type, color, shape or design. Also learn to order numbers according to magnitude or by being even or odd. 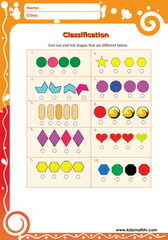 By doing these activities, kids will learn to find patterns in daily life activities. This is a useful resource page for parents and teachers of primary school kids. 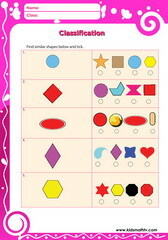 Practice Different shapes with this worksheet. 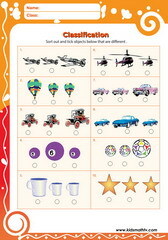 Practice Same but different object size with this worksheet. 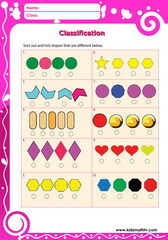 Practice Same with this worksheet.